KENNETH TURAN, Times Film Critic - "MOVIE REVIEW - 'Recommended' Forster Wears This 'Diamond' Well A small tale about gem salesmen gets a big boost from the actor, who quietly adds depth. By KENNETH TURAN, Times Film Critic 'Diamond Men' is an easygoing venture of the feel-good variety. What sets it apart is something even larger pictures often lack: an excellent performance by its star. 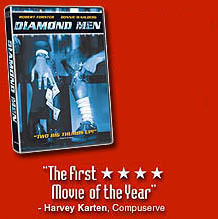 Watching "Diamond Men," it's easy to see what the fuss about Forster is about. The actor has a gift for simply existing on the screen, for bringing an almost casual but unmistakable depth and dignity to roles.